ETree is used to model a safety system (set of safety barriers) as an event tree. It produces simple models suited to all domains (aeronautics, automobile, rail, oil & gas, etc.) and is an easy way to obtain risk matrices. The ETree module uses ALBIZIA, the BDD (Binary Decision Diagram) computation engine developed by Total. ALBIZIA offers the advantage of running accurate analytical computations and providing extensive information on the system under study. Users can easily create event trees via an intuitive graphical interface in which barriers can be added after an initiating event (gas leak, supply loss, overflow, etc.). Each scenario (called a sequence) is therefore defined by a succession of barrier failures and successes. Each sequence has a consequence chosen in a list created by the user. A risk is defined for each consequence, and can then be positioned on the X-axis in the risk matrix. Then the software calculates the frequency of the consequence and assigns it to the Y-axis. The frequency of initiating events and probability of failure of safety barriers can either be constant, follow a probability law (Exponential, Weibull, Periodic-Test….) or be defined by another type of model: fault tree, reliability block diagram or safety instrumented loops via the Boolean module. Several risk matrices – human, financial or environmental for example – can be defined. For each one, the user can determine criticality levels: moderate, serious, major, etc. Templates: Do you regularly carry out studies using the same safety barriers? 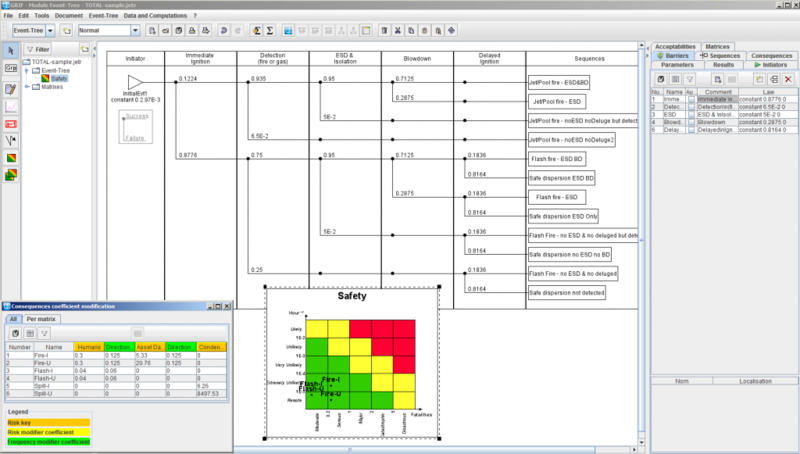 With GRIF ETree you can construct templates with a certain number of pre-configured barriers and risk matrices. If you want to create a new event tree, all you have to do is open the template and enter the parameters/coefficients. Risk matrices display an average frequency. But when the initiating event or the barriers are no longer constant laws, it is sometimes necessary to display the frequency variation of a sequence (scenario) or of a consequence over time.